Rootstock Software is an up-and-coming cloud manufacturing ERP provider, built on the Salesforce.com platform. Last year, we reviewed Rootstock in our post on ERP systems in the Salesforce ecosystem. This post provides an update, based on our interviews with Rootstock executives and customers about the progress the firm has made over the past year. With a long history in manufacturing systems, the Rootstock development team built the first iteration of its system in 2008 on the NetSuite platform and then in 2010 rewrote it on the Salesforce platform, where it has continued development over the past five years. Historically, Rootstock restricted its efforts to manufacturing and supply chain functionality. 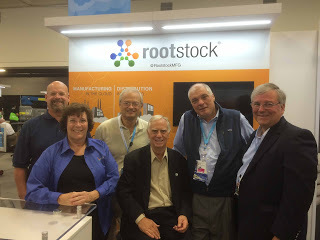 When customers needed accounting systems, Rootstock would usually bring in FinancialForce, another AppExchange partner. Then, just before the Salesforce user conference this month, Rootstock announced that it was building its own native financial applications. The new suite of Rootstock Financial Apps, due for release in early 2016, will include general ledger, accounts receivable, accounts payable, and financial reporting. The new accounting functionality is designed to support a two-tier ERP strategy in larger companies, where individual business units or facilities run Rootstock’s operational and financial systems with integration to the company’s corporate general ledger and financial reporting systems. Interestingly, Rootstock had just begun to also offer integration with Intacct’s cloud accounting system, which is built on its own cloud platform. Furthermore, Rootstock CEO Pat Garrehy recently indicated that Rootstock will also provide integration with the newly-unveiled Sage Live accounting system, which is also native on the Salesforce.com platform. The historical relationship with FinancialForce will also continue. With so many choices of accounting systems, we asked COO Chuck Olinger why Rootstock felt the need to also develop its own financial modules. He indicated that in some deals, customers prefer to deal with a single vendor and sign one software agreement. In our ERP selection consulting, we often see customers turned off by solutions requiring too many complementary products. Rootstock’s approach is probably the best of both worlds: offering a single solution out of the box, with options for other accounting systems for customers who need the particular strengths of those partner products or already have them in place. In the Salesforce ecosystem, Rootstock is one of the early adopters of the Salesforce Wave Analytics Platform. This platform, first announced in 2014, adds a much-needed business intelligence capability to the Salesforce platform. Traditional BI solutions are written and deployed external to ERP systems. Generally, this means a user will need to toggle between two applications: the transactional system and the reporting system, creating disjointed business processes. The idea with Wave is to provide business intelligence and reporting directly in the transactional system, by means of a Wave Analytics dashboard. Customers can then create a menu of custom actions to handle the most typical responses needed. Salesforce is not the first provider to embed BI in its transaction system or make it part of its development platform. Other vendors, such as Oracle, SAP, Workday, and Infor have already been down this road. Salesforce, to some extent, is actually late to the party. Rootstock will be rolling out Wave Analytics as the platform for its new performance reporting capabilities. The new ERP Performance dashboards, now in pilot stage, allow users to define and report on key performance indicators and other metrics to serve as early warning signs and prompting users to take action. In early 2014, we saw about 35 customers listed on Rootstock’s website. At this time, we count nearly 60, which shows good market traction. At Dreamforce, we had the opportunity to interview Scott Johnson, senior director of planning and fulfillment at Solar City, a solar energy system installer for residential and commercial facilities. With 10,000 employees, rapid growth, and Elon Musk as its Chairman, Solar City will be an important reference account for Rootstock. Solar City’s manages an enormous number of concurrent customer projects. Today, there are about 90,000 active jobs. This is because within a customer project, each rooftop is a separate job, with its own configuration. For example, a 300 unit housing development will call for 300 unique jobs. To get an idea of the scale of its operations, consider that its customer base includes Wal-Mart, eBay, Intel, the US Department of Homeland Security. This volume of activity is a key operational requirement, as it directly affects the MRP workload. We have seen other cloud ERP providers that struggle with MRP explosions in a multi-tenant cloud environment. But Johnson indicated that Rootstock can do a full MRP explosion of Solar City’s material plan in just 15 minutes. Rootstock went live at Solar City with MRP as a first phase in February. An early benefit is that the new system now allows incoming material receipts to be drop-shipped directly to the local job point of use, bypassing the central warehouse. The rest of the new system in being rolled out in phases. On the international front, as we reported last year, Jan Baan (founder of Baan Software) joined Rootstock’s advisory board. We had the opportunity to speak with Baan at a Rootstock reception at Dreamforce, where he told us about his first sale for Rootstock in Europe through his team at Vanenburg Software, a Rootstock channel partner. Rootstock also claims customers outside of the U.S. in Canada, Europe, Asia, Australia/NZ, and even Africa. Having been at this for over eight years, Rootstock is well down the development cycle and is a credible solution for supply chain planning and manufacturing, including hybrid modes of manufacturing. Its ability to handle project-based manufacturing and services is also attractive for many newer companies at the leading edge of innovation. Its support for multiple companies and multiple sites from a single tenant on Salesforce.com is particularly important as it sells into larger deals. As indicated earlier, the lack of native accounting applications has been a constraint in some deals. As Rootstock now rolls out its own financial systems, that issue should become less of an obstacle. Its open approach to integrating with other financial system providers may bring opportunities from those partners as well. As with any ERP systems—whether cloud or on-premises—Rootstock is not a good fit for every situation. In our ERP selection consulting, we find Rootstock particularly candid about where it thinks it is a good fit and where it should pass on an opportunity. This is a sign that the firm has a healthy pipeline. Buyers considering Rootstock should take a look at the customer profiles on Rootstock’s website. Those will give a good indication of whether there is likely to be a good match. This entry was posted in ERP Selection and tagged Cloud, ERP, Rootstock, SaaS, Salesforce.com. Bookmark the permalink.